The first musical movie I ever saw was The Sound of Music and I’ve been a fan ever since. In fact, I liked the music and story so much that many years ago I persuaded my siblings to recreate scenes, and we put on an elaborate show and even sold tickets to see creative (read: bad) props and special (read: out of tune) singing! I still enjoying pulling out this musical movie, and there’s actually a lot of history that inspired it. First, the Von Trapps were a real family! Second, the Nazis really did take over Austria. Be forewarned… There are serious spoilers ahead! Young Maria plans to devote her life to religion and God’s work as a nun, but she can’t seem to stop acting impulsively and singing. Mother Abbess instructs Maria to take a leave of absence and work as a governess for the Von Trapp family who lives in a mansion outside town. Maria meets the seven motherless children who will be in her care while their father returns to Vienna to court his girlfriend, the Baroness Elsa Schräder. Maria quickly wins the children’s confidence by letting them play and teaching them to sing. When Captain Von Trapp returns home, he finds his strictly run house in “chaos” and resorts to shouting and blowing a signal whistle until Maria confronts him about needing to care about his children. The captain makes attempts to get to know his children and discovers that they are all fine singers. At a fancy welcome part for the baroness, Maria and the captain dance together and the baroness jealously tells Maria the captain is in love. Frightened and realizing she is love too, Maria flees back to the abbey, leaving the distraught children who don’t want their father to marry the baroness. Mother Abbess talks to Maria and instructs her to return to the Von Trapp family. Maria agrees to finish her summer commitment as a governess, but when she returns, she finds the captain and baroness in an unhappy engagement. When that engagement is broken and the baroness leaves, Captain Von Trapp proposes to Maria, and they get married – much to the delight of the children. While Captain and Mrs. Von Trapp are away on their honeymoon, the Nazis take over Austria. The children – who were looked after by “Uncle Max” (a family friend) – are scheduled to sing in the local festival. Liesl, the eldest Von Trapp daughter – is saddened to discover that her boyfriend has joined the Nazis. Returning from their wedding trip, Maria and the captain discover that the Nazis have ordered him to join their navy; the family decides to escape and leave Austria. Held up by the local Nazi supporters, the family declares they were leaving to sing at the festival and perform on the big stage before making a get-away to hid at the abbey. They eventually escape and cross the mountains to Switzerland. A publicity photo of Mary Martin and the children from the original stage production. In 1959, the Von Trapp Family’s story was adapted for a Broadway musical. The writers took liberties with the family’s true story, but produced a masterpiece musical. 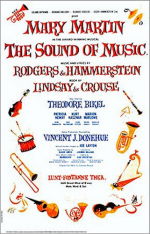 The Sound of Music – Rodger and Hammerstein’s last musical – originally starred Mary Martin and ran for 1,443 Broadway performances. The stage musical differs from the movie version in some aspects and sequencing and has been revised and officially re-run several times in theaters around the world. In 1965, the movie version The Sound of Music released. Filmed on location in Salzburg, Austria, and starring Julie Andrews and Christopher Plummer, the film won five Academy Awards. 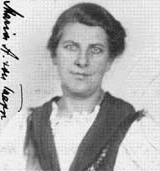 There really was a Von Trapp Family, but their story in the musical and movie was “adapted.” Rupert, Agathe, Maria Franziska, Werner, Hedwig, Johanna, and Martina had lost their mother and in 1926 their father – naval commander Georg Von Trapp – asked for a teacher from the abbey in Salzburg to come and tutor one of the children who was struggling in school. Maria Kutschera arrived and eventually started looking after all the children. Realizing how important and cherished Maria had become to his children, Georg asked her to marry him, but Maria fled back to the abbey to think about the situation. When the nuns counseled her to follow God’s leading and get married, Maria was angry. However, she did marry in November 1927 and admitted that she learned to love her husband and new family. The family faced financial ruin during the Great Depression, and when they were forced to rent rooms in their mansion, they met new friends who heard the family sing and persuaded them to enter performance contests. The family of singers became popular in the Austria, but when the Nazis took over in 1938, the Von Trapps became uncomfortable with the restrictions, disappearance of their friends, and moral dilemmas enforced by the Nazis. The orders for Captain Von Trapp to join the German navy was the breaking point. The family escaped to Italy, England, and the United States. 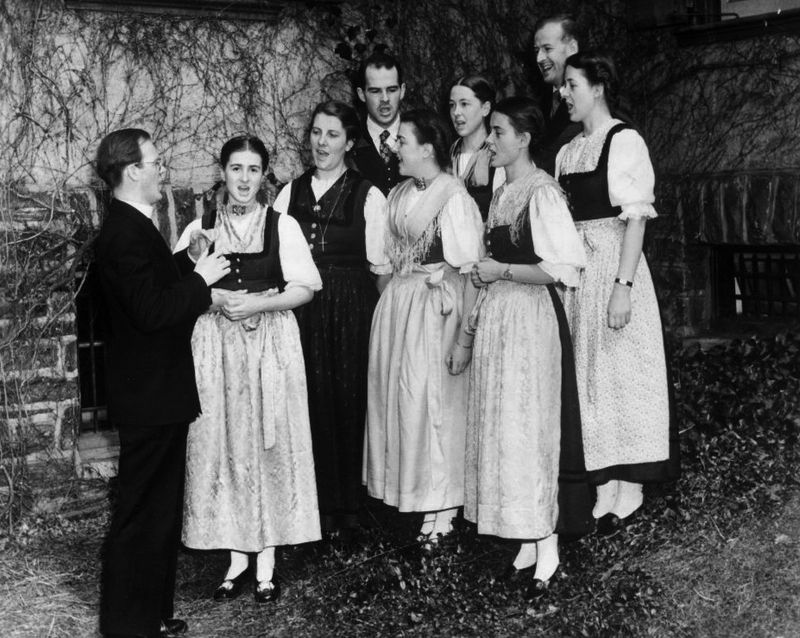 In America and Canada, the performance name “The Von Trapp Family Singers” was born, and they toured across the countries, and after World War II, toured internationally, often helping to raise funds for war-impoverished Austria. Maria and Georg had three children of their own, making ten children in the group when they all sang together. Maria and the children became U.S. citizens and for years ran/hosted a music camp near their home in Vermont. 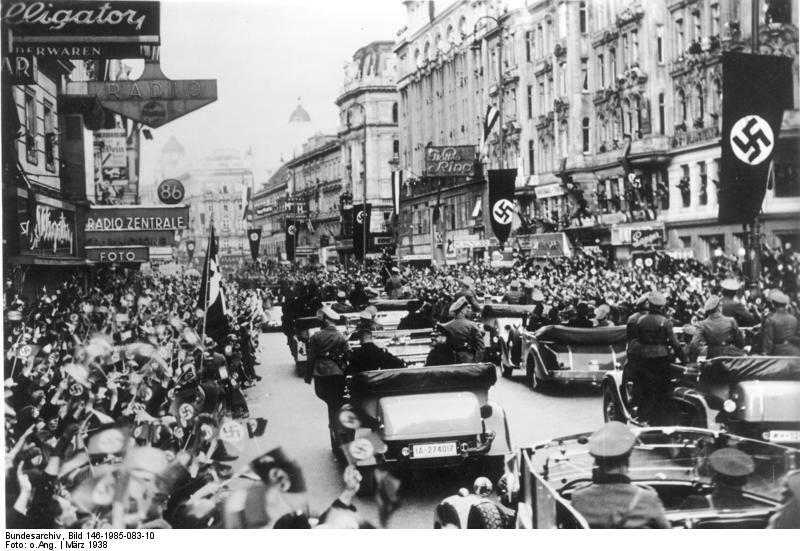 On March 12, 1938, Germany took over Austria. Was it an annexation or reunion? That depends on the perspective. The idea of uniting Germany and Austria did not original with Hitler or the Nazis, but Hitler desperately needed Austria and Czechoslavakia to gain control of their economies and fuel his continued arms race with other European powers. Faced with the reality of Germany taking over, Austria tried unsuccessfully to resort to law making and votes to resolve internal conflict and riots. Finally, Hitler issued an ultimatum on the situation and sent troops when the requirements were met. When the Nazis entered Austria, hundreds of thousands turned out to cheer – many of them excited by the months of slow propaganda work that had been used in the country. Hitler himself took a victory tour through the nation. Not all Austrians were pleased or safe, though. Dissenters or others who failed to follow Nazi orders were sent to holding camps. Jews were persecuted and sent to concentration camps. Overall, the world stood by and watched the Anchusslash; there was no military response. The Sound of Music is historic in the history of Broadway and Hollywood, and it was clearly inspired by history. Though taking many liberties with the facts, the musical highlights the lives of real Austrians who became internationally famous after they escaped from Nazi-held Austria in the 1930’s. I’ve heard people discuss the differences between the first half of the musical and the “darker” second half which features the Nazi takeover. Sure, I personally prefer the first half of the musical, but I think that contrast and the conflicts shown through the entertainment is important and should drive us back to the history books to learn about national conflicts and how it affected the real people who lived through those times. We love Sound of Music too. Thanks. BTW: The “signal whistle” is a boatswain’s pipe (usually pronounced “bos’n”), standard navy shipboard signaling device for centuries. It has many different calls for various orders and activities, originally on sailing men-of-war. Still used ceremonially in the navy.